There’s no denying that big, stately oak trees add character and beauty to any landscape. Unfortunately, an old pest has presented a new threat to red and pin oak trees in the Front Range. Kermes scale, a familiar parasitic insect that feeds on sap from the vascular tissues of oak trees, has recently been associated with the destructive bacteria Lonsdalea quercina in Boulder. The combination of the two ailments has proven to be very destructive, resulting in the death and removal of many of Boulder’s most beautiful oak trees. Fortunately, infestation is fairly easy to identify and there are a few treatment options available for controlling kermes scale infestations. A quick background on the key players: kermes scale is a parasitic insect that survives on oak trees by piercing the bark of the tree in order to feed on the sap and nutrients present in the vascular tissue. While healthy trees can generally withstand a moderate level of scale infestation, prolonged periods (think multiple growing seasons) of pest activity, especially when combined with the presence of other pests, infections, or environmental stressors, can cause severe decline and often death. That brings us to the associated bacteria, Lonsdalea quercina. Lonsdalea is thought to be introduced to the vascular system through kermes scale feeding sites, and causes excess amounts of sticky substance to leak from acorns and twigs (the condition is aptly referred to as drippy nut disease, or drippy blight). 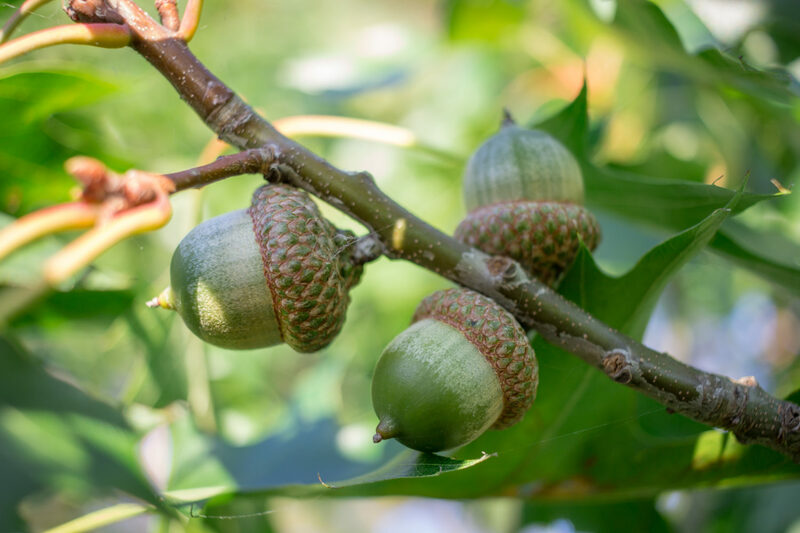 Over time, excessive seeping leads to decreased acorn production, as well as leaf and branch dieback. If left unchecked, especially in the presence of other stressors, this will lead to tree decline and, possibly, death. So what can you do to save your red and pin oak trees? The easiest and perhaps most important measure is to observe your tree regularly. Things like clusters of wilted, brown, or dead leaves or excess amounts of sap dripping from the tree are obvious indicators that something is going wrong and that it may be kermes scale related. If you are able to reach the lower branches of the tree, or can find newly fallen branches or twigs, look near the base of leaves (though they may appear anywhere on newer growth) to check for the woody brown scale left behind by adult females. Keep in mind that the scales often look like buds, so don’t hesitate to give us a call to have an arborist come make a positive identification! While you’re up-close and personal with your tree, be sure to also take a look at leaf bases and acorns for any buildup of sticky substance indicative of Lonsdalea quercina. If any of these physical symptoms are present, there is a good chance your tree is infected and it’s time to treat. One last note on this subject–please don’t climb into your tree if you can’t easily search for signs from the ground. Let our trained, certified arborists take care of the leg work for you! Once you have determined whether your tree has kermes scale, it’s time to think about treatment. While there are a few options available, at Blue River Forestry and Tree Care we prefer a method that has been proven both effective and more eco-friendly than the alternatives. We spray a combination of two oil based products, Ecotrol and Golden Pest Spray Oil, onto the bark of the tree in spring before buds begin to swell. The oil in the mix smothers over-wintering nymphs before they have a chance to form a protective shell, and the essential oils found in Ecotrol may also interfere with nervous system function and feeding behavior. While the spray is not targeted towards the Lonsdalea bacteria specifically, controlling the feeding behavior and population size of kermes scale will minimize points of entry for the bacteria. In addition to being an effective method of controlling certain pest populations, horticultural oils are safer for most vertebrates and non-targeted beneficial insects (such as bees) than traditional pesticides. Horticultural oils also have a reduced residual, so proper application means a decreased long term impact on the surrounding environment. It’s important to remember, however, that these oils are chemical pesticides and therefore require knowledge and expertise for proper application. Runoff, drift, and bioaccumulation are all risks that can be mitigated through weather monitoring and application timing. Appropriate equipment is also an important consideration: using spray rigs powerful enough to reach the entire tree maximizes product effectiveness while minimizing application to the surrounding landscape, and using proper personal protective equipment reduces the risk of applicator skin and eye contact. Kermes scale and Lonsdalea quercina infestation can become a serious problem for your oak trees, but that doesn’t need to be the case. If you have any concern about your oak trees and kermes scale, now is the perfect time to have an arborist come make an accurate diagnosis. A positive diagnosis during the winter will give your arborist time to schedule an appropriately timed spring spray treatment, as well as come up with an on-going pest management plan to suit your needs and maximize the long term health of your trees.